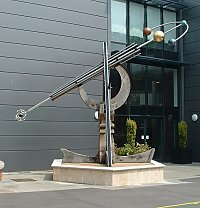 In front of the Bristow-Clavell Science Centre at Portsmouth Grammar School. 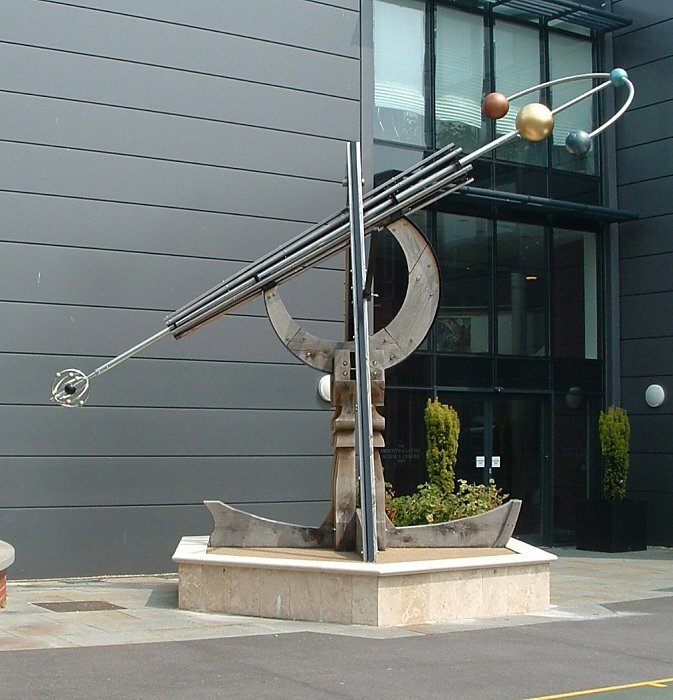 This specially commissioned five metre tall work – officially named Celestial Microscope - was crafted by Petersfield-based Charlie Carter and his team at his Froxfield Green studios and now stands at the entrance to the Bristow-Clavell Science Centre. Celestial Microscope is made from green oak, douglas fir, cedar, stainless steel and copper with the representation of a carbon atom at one end which can be turned to spin the solar system at the other. Charlie Carter said the Celestial Microscope had been both technically and physically his most challenging work, right up to the moment of installation but also his most rewarding creatively and a fantastic experience. He said he found inspiration and the answer researching the school's history and its 18th Century founder, Portsmouth garrison physician Dr William Smith, leading him to explore early medical instruments, microscopes and optical implements, beautiful objects in their own right. Mr Carter explained he chose Celestial Microscope as the title after much thought and hoped it captured a sense of looking down at the teeming life of ours on Earth, an impression of a celestial world watching us through the wrong end of the telescope.